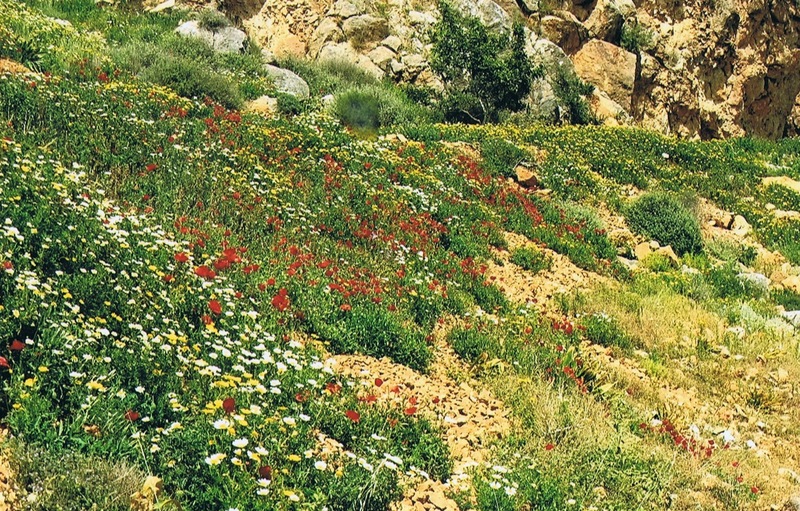 A six day hiking trail in Crete south-west: Sfakia. 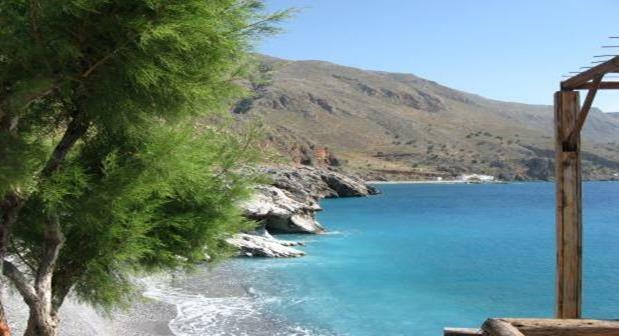 A six days hiking trail in Crete south-west: Sfakia. Descending and ascending a number of gorges, along quiet beaches, (abandoned) historical settlements, and - in spring- seas of flowers. Getting there: a flight to Chania and with the public transport (taxi, bus) to Chora Sfakia. Or you arrange your own transport. Crossing the mountain area, from Chania to the South West of Crete, takes about 2 hrs. We started our hike in Chora Sfakia. In organizing this hike we have had great help by a local travel agency: The Happy Walker. They know the possibilities on the island very good (accommodation, the trails, maps….). Accommodation: rooms, hotels. Enough accommodation in the villages on the coast. 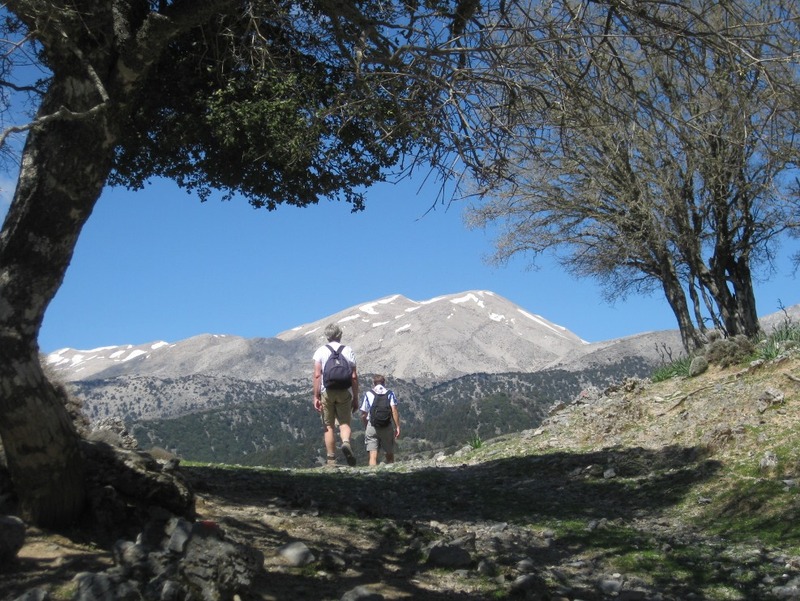 Map: we used the hiking map Lefka Ori (White mountains), Sfakia, pub.by Anavasi, nr. 10.11. Scale: 1:25.000, GPS compatible. April 2013: a six days hiking trail through an endless variety of landscapes, with - in spring- nice temperatures (not too hot for walking). Indication of height: sea level up to 1130 m. (day 6). 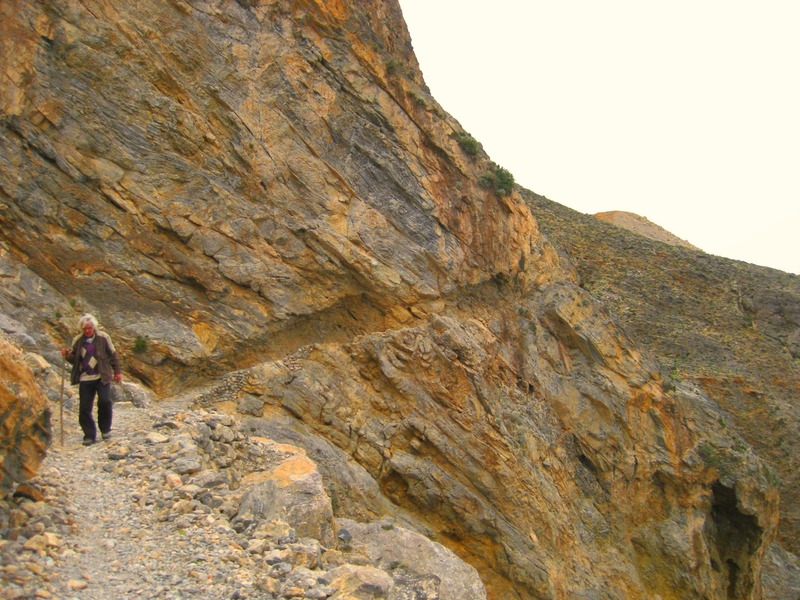 Day 1: Imbros (780 m.) - Imbros gorge - Chora Sfakia - Loutro……………………….........19 km. Day 2: Loutro - Livaniana (250 m.) - Aradena - Agia Katarini (650m) - Loutro.......…..16 km. 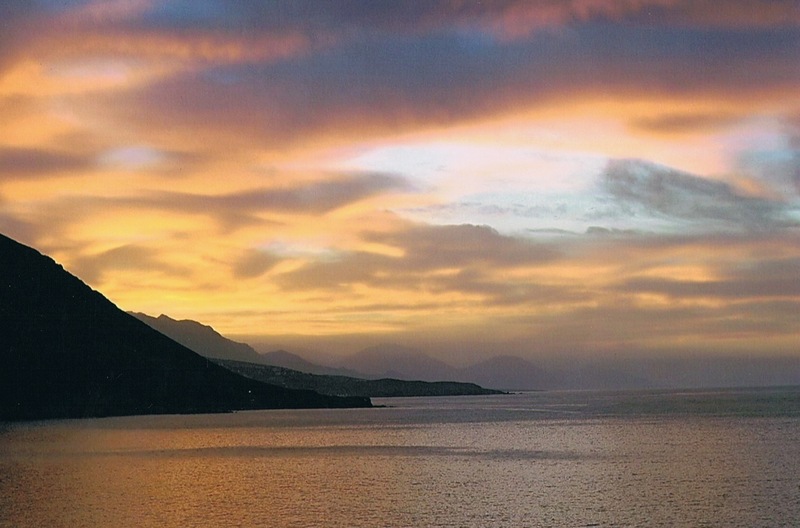 Day 3: Loutro - Agio Roumeli (the E4, coastal track)..………………………….....…...….........15 km. Day 4: Agio Roumeli - Samaria gorge (up and down) - Agio Roumeli...….....…up to 18 km. Day 5: Agio Roumeli - Agios Ioannis - Anopoli- Chora Sfakion..…………….................….27 km. You can take a taxi for the last 10 km.’s. On Crete everyone “is” a taxi……..
Day 6: Imbros (780 m.) - 1130 m. - Sfakiana gorge- Chora Sfakia………………….....…....18km. 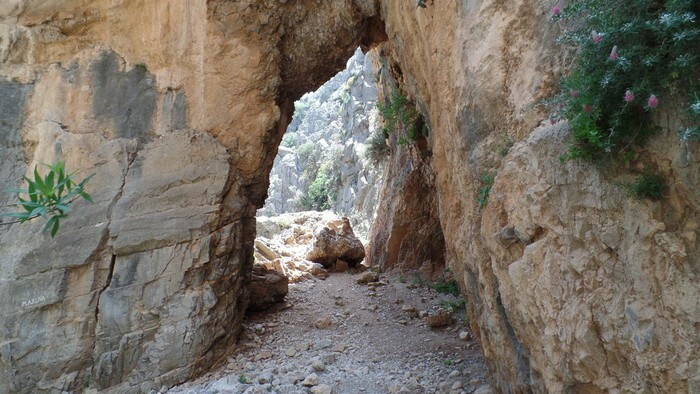 On trail: beautiful hiking trails through gorges, including the world-famous Samaria gorge, but also through less known but certainly no less beautiful other gorges, like the Imbros gorge, the Aradena gorge or the Sfakiana gorge. Using the coastal track (E4), old tracks between settlements, sometimes asphalt, along beaches or using trails maintained by local mountaineering associations. Churches, ikonastasis, the remains of the Minoic settlements in Aradena, 3300 - 1450 before Christ. Agios Pavlos,disciple Paulus, day 3, (the chapel is on the spot where Saint Paul reportedly baptized people on his way to Rome). The Turkish fort above Agio Roumeli. 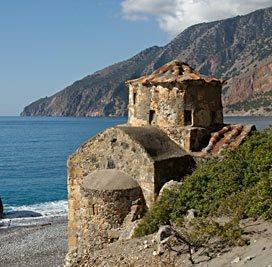 The path leading to the fortress of Agia Roumeli will take half an hour and does not present any particular difficulty. The view from the top is breathtaking and rewards every traveler. Olive plantations, pine and cypress forests, and - after steep climbs - the breath-taking views at the White Mountains or the deep blue Mediterranean Sea (Lybian Sea) .